22 and Counting... ~ The Bucky Channel - The World of Sports from Wisconsin's Perspective. That's right folks these high powered Brewer hitters haven't scored a run in 22 straight innings. And you can't blame Hoffman for this one, or the starting pitching. 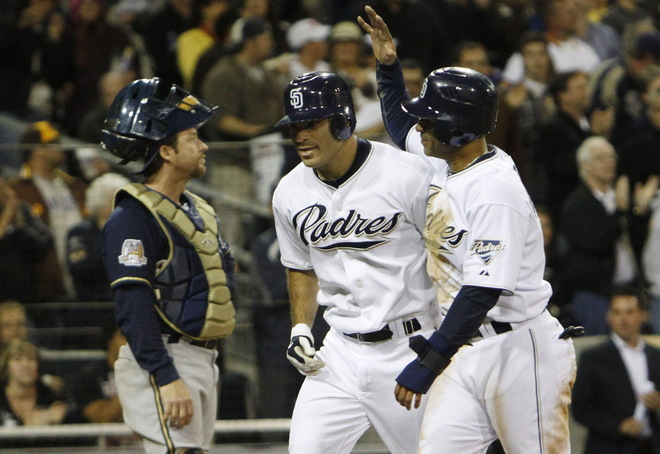 The Padres are hot right now, but the Brewers should be able to score a few runs. Friday night the pitching crew of Clayton Richard, Luke Gregerson, Mike Adams, and Heath Bell dominated the brewer batters. Combined they pitched 9 innings, 6 hits, 3 walks, 13 strikeouts, and no runs. Almost half of the outs were strikeouts, and that is when you know the Brewer bats are off their game. Of all the strikeouts two of them were looking the 9th inning. I'm more of a NBA and NFL guy, but wouldn't you be swinging down 3-0 in the 9th inning? On the other hand Dave Bush had a good start for the Crew. He worked 7 innings, 6 hits, 4 walks, 3 strikeouts, and 3 earned runs. That is a good thing to see from Bush after just getting rocked last outing against the Cubs at home. Bush has had a decent year so far, but he really needs to work on cutting down those walks. He really made one bad pitch Friday night as Scott Hariston took him deep to left field. None of that matters if your offense doesn't put any runs on the board. Dave did his job to keep us in the game, and that is all we can ask of him. So just how bad was the hitting Friday night, well if all the stuff above isn't enough here are some more notes. Criag Counsell and Dave Bush had two of the Brewers total six hits. Prince Fielder, Casey McGehee, and Alcides Escobar were combined 0-10, and six strikeouts. All six of the Brewers hits were singles, you must have some extra base hits if you want to win games. Rickie Weeks was the only Brewer to touch third base, and that was because of throwing error by the shortstop. Just not a good night for Wisconsin sports Friday night, both the Bucks and Brewers played like crap. Few side notes from the game Friday night. Casey McGehee was back in the lineup for the crew. He missed the first game in the Padres series because his wife was giving birth to their second child. Congrats to the McGehee's for their new Daughter. That was positive news for the Crew, but Carlos Gomez left the game Friday with a strained knee. He was trying to beat out a bunt in the first innings, and something just didn't seem right. He is going to have a MRI on his knee, so lets hope it is nothing serious. Any updates on his injury I will try to keep them posted on here. Yup, we've got uniforms and everything. It's really great!